Team India, fresh from the victory of Kingmead(Durban) will take on wounded Proteas in 3rd and final series decider test match at Newlands(Capetown) from tomorrow. This test match will definitely have a great climax in making considering the performances of both teams in last two test matches of the series. A mouth-watering contest in offer for cricket lovers if weather will not interrupt. 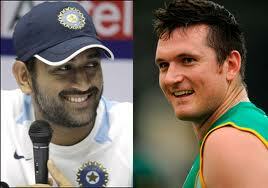 Proteas are desperate to take on Team India after humiliating defeat at Durban. If the words of Newlands curator is to be believed then pitch will going to favour batsmen means it will turn out to be a high-scoring game and batsmen will make merry on this ground for next five days and bowlers will suffer badly after dominating partially first test match full second test match. 1. Return of Gautam Gambhir to the team will boost the chances of good start up-front. 2. Bowlers especially, Zaheer, Harbhajan, and Sreesanth looks confident after their good performances in Durban. 3. Batsmen will relishto play on this pitch which is similar to sub-continent pitches which will not have lateral movement and will assist spinners as well. 4. 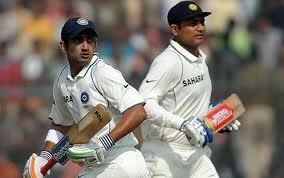 Laxman and Dhoni are in good form with bat. 5. Catching was impressive in Durban and expected to be the same at Capetown. 6. Confidence of last match victory. 1. Poor batting form of Rahul Dravid and Virender Sehwag. 4. Failure of Sachin Tendulkar in Durban. 5. Batting friendly pitch will not suit Indian bowlers. 6. Poor record from previous outings at Newlands. Its 2-0 in favour of Proteas. 7. Consistent poor luck of Dhoni with the toss. 3. 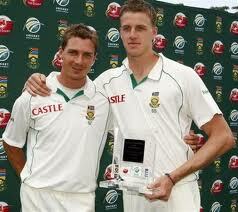 Superb form of pace bowlers Steyn, Morkel and Tsotsobe. Morkel and Steyn have more pace than Indian bowlers which will help them to extract more from the batting friendly pitch. 4. Good batting form of all the batsmen. 5. Superb ground fielding and catching. 6. Support of home crowd. 7. Good winning record at Newlands. 1. Paul Harris: Average spin bowler, a big weakness of African armoury. 2. Failure of Kallis in Durban. 3. Smith's vulnerabilty against Zaheer Khan. 4. Pressure of defeat in Durban. I feel Proteas must drop Paul Harris and include Wayne Parnell in their line-up and go with all pace attack. Parnell is also handy batsmen down the order. On the other hand i feel must drop Ishant Sharma looking at his poor performance in first two test matches and include Umesh Yadav who is very quick and sharp compared to other Indian bowlers. Series is at stake for India and it is golden chance for India to win its first ever test series in South Africa. So looking at over all advantages and dis-advantages of both the teams it looks like Proteas are better contenders to win the final test match and will win test series 2-1 as per my assessment.